The YGC has a wide variety of members from many different walks of life. 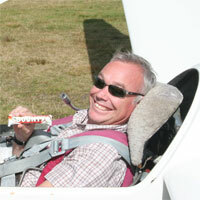 A&E Consultants, Artists, Teachers, Engineers, Students... all enjoy gliding as a fulfilling and engaging sport. It's the perfect form of escapism from everyday life or a stressful job. George Rowden is a Senior Citizen with a love for the beauty and challenge of soaring like a bird. George started gliding in 1961 at another gliding club, becoming an Assistant Instructor and flying until 1981 when financial, business and family pressures led to a break from flying. After retiring, he joined the YGC in 2003, re-soloing after 4 launches and now flies 2-3,000 kms per year cross country as well as taking people up for introductory flights as a Basic Instructor. 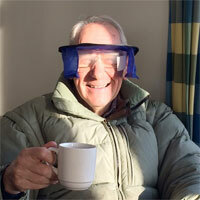 George is seen above wearing 'Foggles' - glasses designed to simulate flying in cloud! 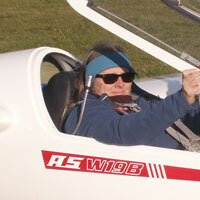 Kelly Teagle is a long-term gliding addict. She started learning to fly aged 15, pursuing her life-long dream. 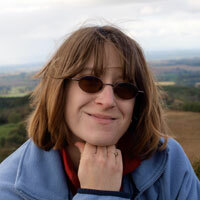 Kelly is now a busy mum and local business-woman, running a Web Design and Software company. She is also an experienced instructor at the Club and loves teaching people to fly. When she's not soaring the skies above Yorkshire and beyond, Kelly can be found cycling along the ground instead. But her real passion is gliding, and she spends as much time airborne as her busy life allows her to! Marian Stanley had her first flight as a Trial lesson at the age of 17 and hasn’t looked back since! Marian now works in the head office of one of the top 4 food retailers. She is also an experienced solo pilot who enjoys taking her glider on expeditions to other clubs and getting involved on the airfield as much as possible. When she’s not gliding, Marian can be found helping young people gain an interest in all things aviation, being involved with the Air Cadets. She can also be found running around Yorkshire taking part in Trail runs on a regular basis. 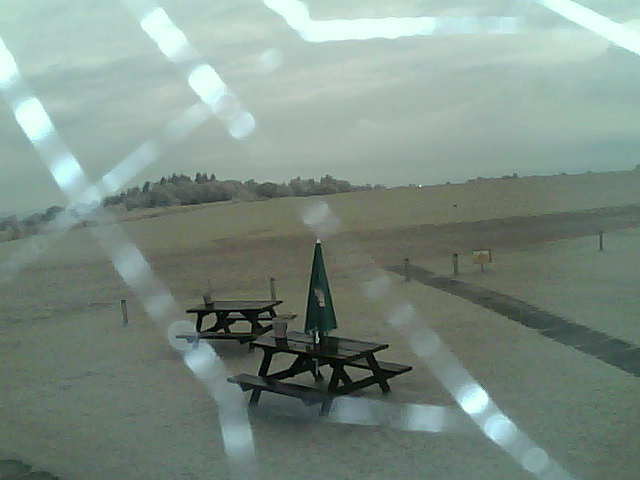 But Marian has a real passion for gliding, and when time permits spends as much time airborne as possible! Polly Whitehead took her first flight in a glider at the Avro Gliding Club when she was working as an undergraduate engineering apprentice for British Aerospace. Her interest in gliding contributed to her gaining a scholarship to train for a Private Pilot’s Licence, which she put to good use by training as a tug pilot to help her fellow glider pilots get airborne! She is also a qualified motor glider pilot. 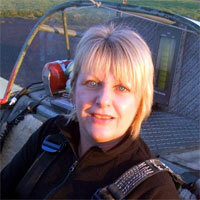 As well as the sheer pleasure of flying, she also enjoys the social aspect of gliding and team work involved. Her ambition is to encourage more women to take up the sport and would like to share a quote from Bessie Coleman (the first female pilot of African-American descent): "The air is the only place free from prejudices". Resh Khodabocus returned to flying after a 20 year break, joining YGC in 2010. Resh learnt to fly after gaining an RAF flying scholarship then doing his PPL aged 17. He stopped powered flying during his university years, had a trial flight at YGC in 1993 but regretfully didn't start gliding then. Some years after becoming an A&E consultant and needing a way of unwinding he returned to YGC to start gliding. Resh flies the club Discus. He often brings large groups of newly qualifying doctors up to the club for corporate days so they can see how good the club is for developing a brilliant hobby that balances a demanding job and busy home life. Richard Watson has been a member of the Club since 2014. Gliding is in Richard's blood. 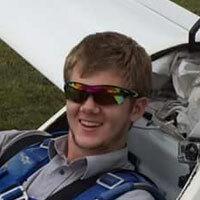 Both of his parents are keen glider pilots and members of the YGC, and Richard had his first flight at an early age. He joined the Club as a student member in 2014 and quickly started flying the Club's fleet of single-seat gliders. He now flies a DG200 and has already started flying cross-country. Richie is a glider-pilot-turned-airline-captain with a lifelong love of aviation. 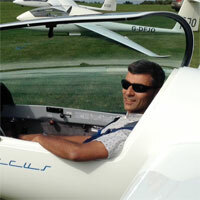 Richie started gliding in 1987 shortly after joining the RAF as an engineering apprentice. Over the next 10 years he became an instructor and flew competitively at national and international level. After leaving the RAF he joined the staff of the YGC as deputy chief flying instructor. He held this position for 3 years as well as studying for his Commercial Pilot's Licence. He now works for Thomson Airways, flying the 737, 767, and now the 787 Dreamliner. Work and family commitments mean that Richie doesn't get to the club as often as he used to but despite travelling the world, gliding remains his true passion. He has a half share in an LS7, and also flies the tugs as well as doing a little instruction when he can.